A standard tile image is made up from 6 stacked pawprints each containing 16 detector-level images. The sky level on all 96 component images is adjusted to the same level and the components are then projected (drizzled) onto a single Tangent Plane WCS image. During the projection the pixel intensities with respect to sky are adjusted to account for the photometric distortion within the original ZPN pawprints. No further photometric distortion correction is necessary for tiled products. Creating tiled images in this simple way has the advantage of preserving edge structures and other artifacts to aid in visual inspection of, say, candidate rare objects and enables most large scale structures to be retained for further investigation. Note that since the photometric distortion correction is referenced with respect to the original pixel scale on the optical axis, the flux for objects on a tile may be a few% different to the equivalent pawprint fluxes. The drawback from a catalogue generating point of view is that edges between detectors can often introduce spurious structures and also subsequent spurious objects in the catalogues. For more reliable catalogue generation from tiles we pre-filter each stacked pawprint image using a nebulosity filter to remove all structure on scales of ~30 arcsec and over. This filter is also fairly adept at reducing edge effects between pawprints. These filtered images are tiled in exactly the same way as previously but since the background is guaranteed to be completely flat for each detector image, the resulting tile image is much more uniform, since it is by design devoid of any large-scale background structure. The tile catalogues are created from these images. More information on the differential sky subtraction can be found here. Example tile frame and confidence map. Each detector potentially has a different PSF and together with the varying seeing conditions that can happen during the observation of a tile this means that there are potentially 96 different PSFs which contribute to a single tile (some of which are combined in the overlap areas). In order to compute the correction for the aperture fluxes we normally assume that the PSF does not vary across the tile. This will inevitably introduce spatial photometric distortions at the level of a few % over the tile. In variable seeing conditions this effect will be significantly worse and can produce systematic spatial offsets of 10-20% or more in the photometry. To counter this problem we have developed a piece of software to track and post-correct the variable flux within the main apertures for tile catalogues. The grouting fix takes as input the tile catalogue and providing all the relevant stacked pawprint catalogues and confidence maps are somewhere to be found, it then computes differential aperture corrections at the location of each detected object, weighted by the confidence map that was used to drive the tiling of the image. The individual detector aperture corrections (#1-7), 96 of them for each aperture, define the differential aperture corrections i.e. the difference with respect to the median for the whole tile. All fluxes and associated errors for apertures #1-7 are corrected, larger apertures are negligibly affect by seeing variations and are currently left alone (ditto the other fluxes). The updated catalogue then has to be re-classified and re-photometrically calibrated. The correction software optionally can fix aberrant individual input detector aperture corrections and also adjust for changes in MAGZPT, i.e. caused by extinction variations, during the pawprint observations. We have been testing the grouting on VHS data and find dramatic improvements in the CMDs and two-colour diagrams for the ~20% of the data affected by large seeing variations during the OB. 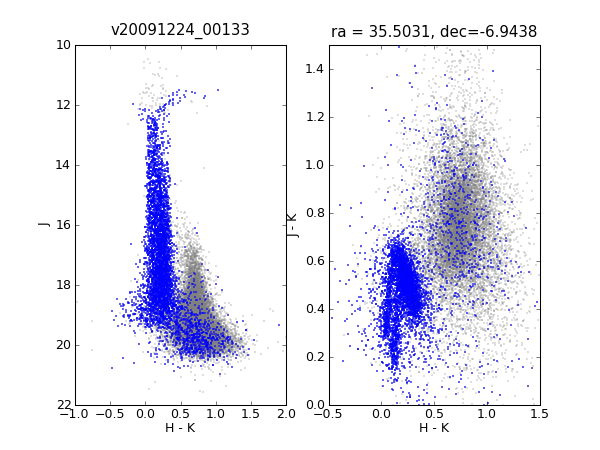 This manifests as either multiple stellar locii or very broadened stellar sequences. After grouting the incidence of problem tile catalogues drops by two orders of magnitude while leaving the other (good) 80% of tiles unaffected. We are carrying out further tests on more crowded fields and if these are successful the fix will be applied to all tile catalogue data. The following diagrams show J vs H-K and J-K vs H-K diagrams from a VHS tile before (left) and after (right) grouting. Two stellar locii are clearly visible in the J-K vs H-K colour-colour diagram of the pre-grouted tile, effect which is fixed in the grouted tile. 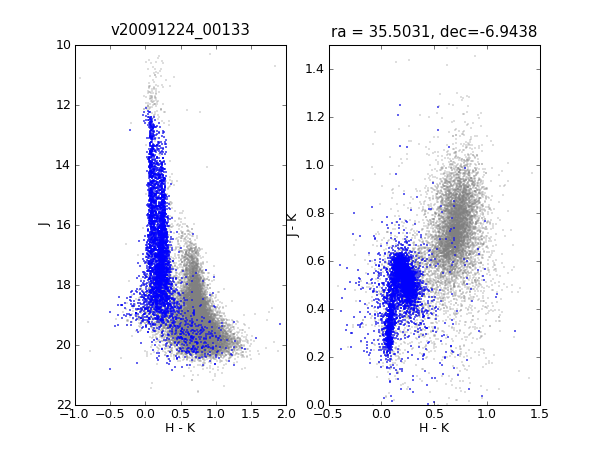 Note as well the improvement on the stellar classification (blue dots represent objects classified as stellar). In VISTA the differential astrometric distortion from a jitter offset is at the pixel level which means that stacking and tiling requires some sort of pixel interpolation. We use a bilinear interpolation method we have dubbed "dribbling" since it is closely similar to the "drizzling" technique. The minor disadvantage of this is the introduction of correlated noise, the effect of which has to be taken into account when determining the true noise level in an image and hence the correct threshold levels to use for object detection. This also impacts on flux and position error estimation. These effects are taken care of in our cataloguing software so the end user does not have to worry about this. More information on the interpolation method can be found on the UKIRT Newsletter No. 25. Different detectors have different saturation levels. As part of the object classification and parameterization we calculate an average saturation level for the full tile. Note that saturated objects are not flagged in the single band catalogues. We recommend a conservative criterion such as saturated objects are defined by peak_flux > 0.9 * (saturate - skylevel). Tiles created post-20120731 have this latter problem corrected. The MJD in the tile headers simply reflects the MJD of the first stacked pawprint used in the tile generation. In turn this pawprint MJD is the first MJD in the dither sequence stack. The provenance information in the headers contain all the tracking required to figure out either the mean MJD of say a stacked pawprint, or if you really want to do this properly the weighted mean MJD of each catalogue object (or even pixel for the truly pedantic) in a tile. This is necessary due to the stacked pawprints making up a tile all being taken at different mean MJDs. To simplify using MJD information in tile catalogues we have co-opted column #63 (for tile catalogues only) to list the relevant mean MJD for each detected object. The information is stored as MJD - int(MJD-OBS) and rescaled to minutes to make it easier to browse. The value of int(MJD) is stored in the header in the keyword MJD_DAY. An example of a tile MJD map for a VMC survey field is shown below (the scale bar units are indeed in minutes with a 1 hour variation across the tile). The overall QC information derived from tile catalogues should always be compared to the component pawprint QC information to get a full assessment of the quality of the observation. Since we use robust estimators (e.g. medians) to derive parameters, such as, for example, the "average" seeing, stellar ellipticity and photometric zero-point, it is possible in variable observing conditions, to have, say, 2 out of 6 pawprints out of specification yet the overall tile properties can appear to be fine. The safest method is to check all the relevant component pawprint properties as well.